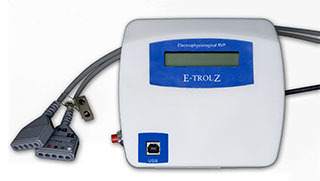 A simple yet powerful clinical research solution, the E-trolZ Biomedical Data Acquisition System is an advanced ECG and EEG recorder designed for low power, portable monitoring of ECG and EEG signals. The Biomedical Data Acquisition System delivers high-end electrophysiological performance in a small lightweight package ideal for ambulatory or portable research. The Biomedical Data Acquisition System performs with the accuracy of large, bulky systems without the need for separate amplifiers, cables, or communications equipment. The Research Instrument enables real-time monitoring or long term storage with user programmable event detection or signal processing. E-trolZ’s systems, customization to meet your specific needs is always available. The research system’s options include: channel quantity (up to 64 channels); channel characterization (band pass filter, gains, coupling); cable interconnection (yoke or connection box); and software (SDK, MATLAB interface).